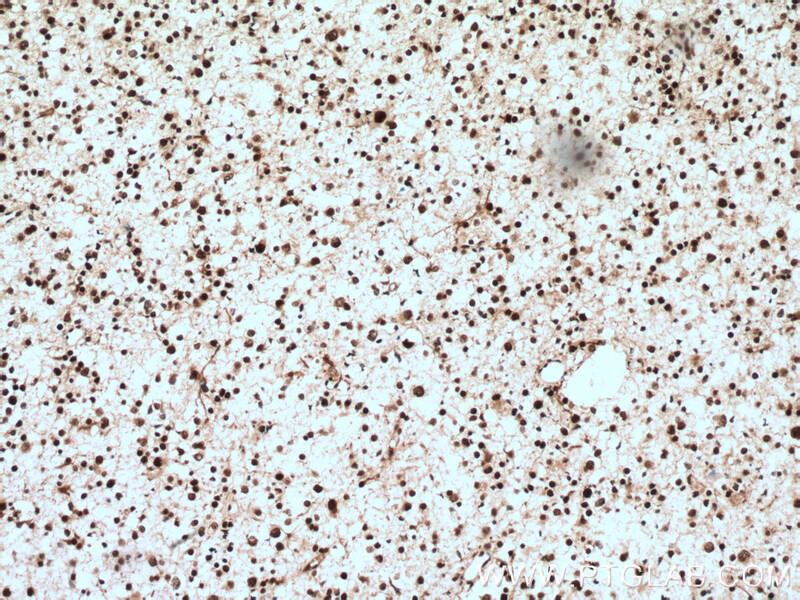 Immunohistochemical analysis of paraffin-embedded human gliomas tissue slide using 12916-1-AP( CUL4B antibody) at dilution of 1:100 (under 10x lens) heat mediated antigen retrieved with Tris-EDTA buffer(pH9). 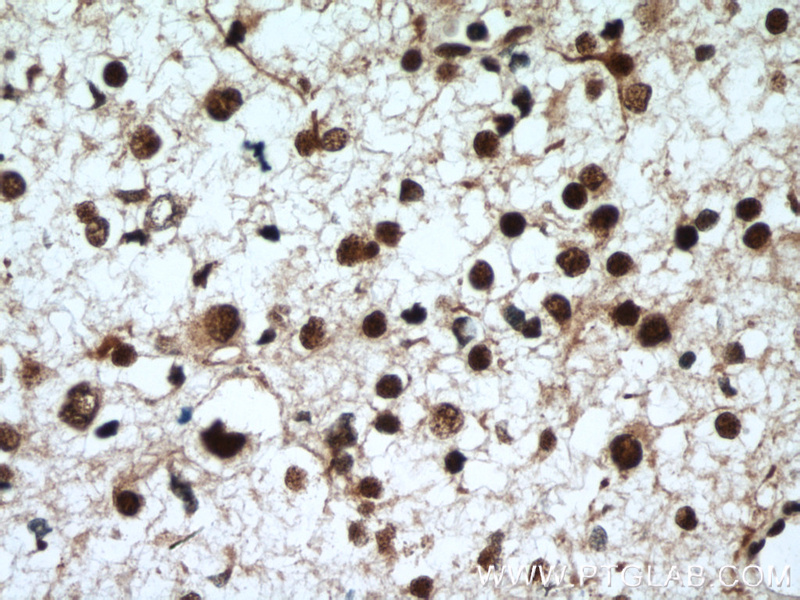 Immunohistochemical analysis of paraffin-embedded human gliomas tissue slide using 12916-1-AP( CUL4B antibody) at dilution of 1:100 (under 40x lens) heat mediated antigen retrieved with Tris-EDTA buffer(pH9). 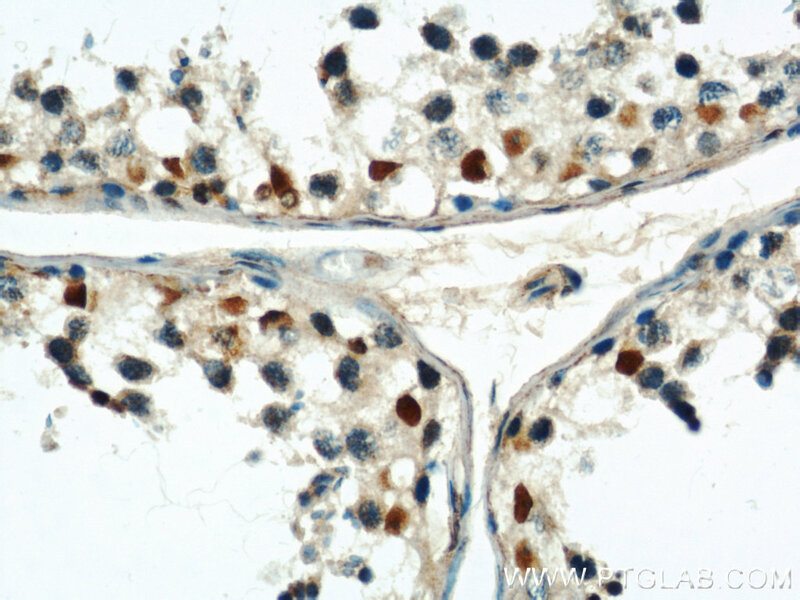 WB result of CUL4B antibody (12916-1-AP, 1:2,000) with si-Control and si-CUL4B transfected HeLa cells. 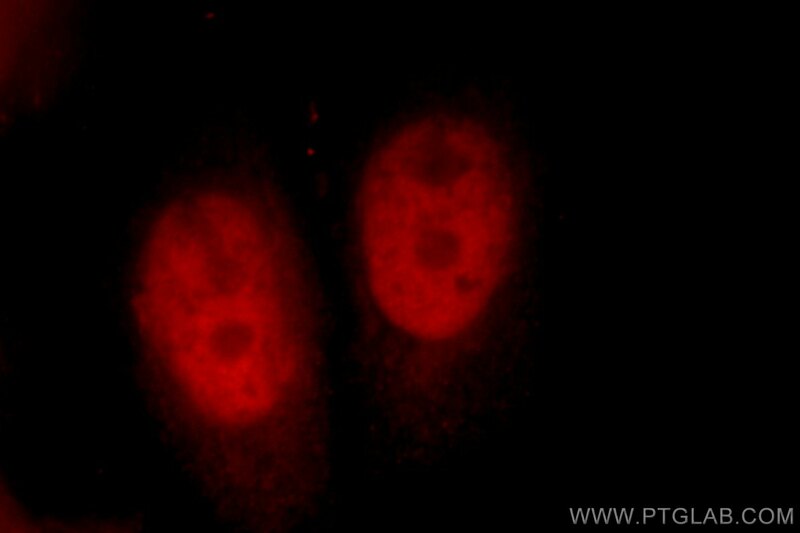 IP Result of anti-CUL4B (IP:12916-1-AP, 3ug; Detection:12916-1-AP 1:1000) with HeLa cells lysate 4650ug. 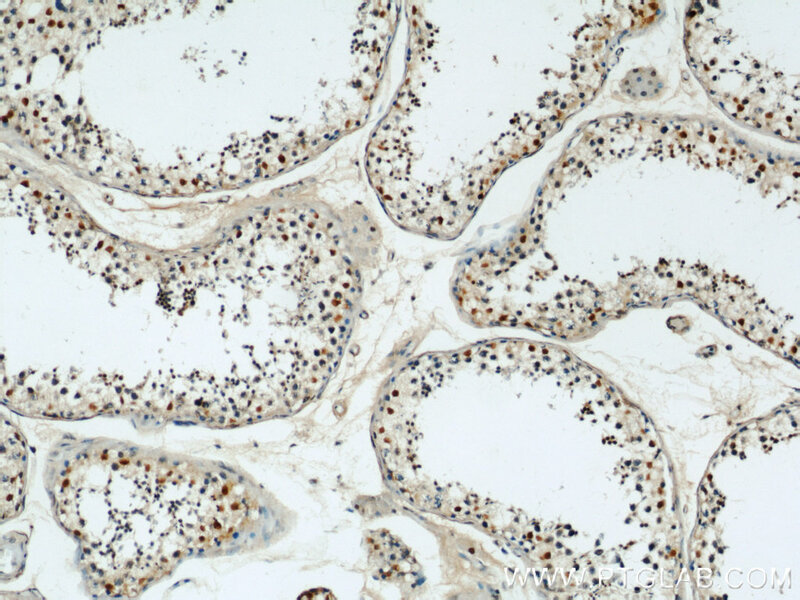 Immunofluorescent analysis of HepG2 cells, using CUL4B antibody 12916-1-AP at 1:25 dilution and Rhodamine-labeled goat anti-rabbit IgG (red). Cullin-RING ligases (CRLs) complexes participate in the regulation of diverse cellular processes, including cell cycle progression, transcription, signal transduction and development (PMID: 21816341)(PMID: 21554755). Serving as the scaffold protein, cullins are crucial for the assembly of ligase complexes, which recognize and target various substrates for proteosomal degradation. 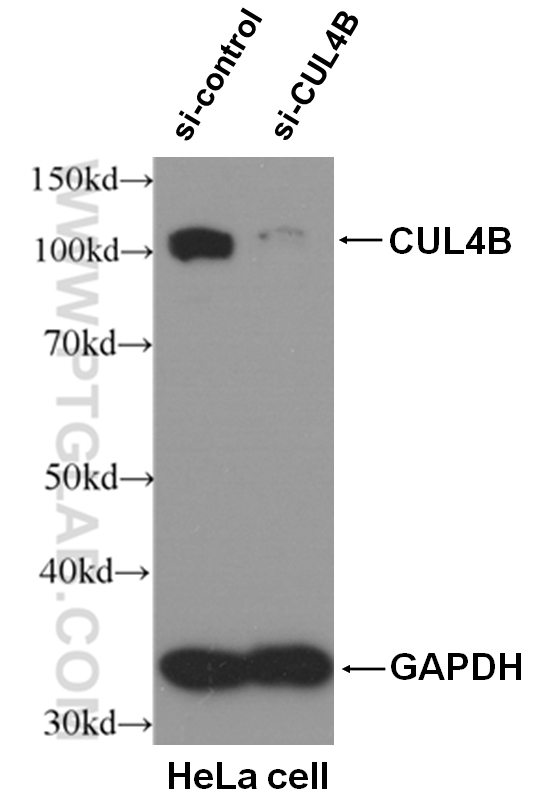 Two cullin 4 (CUL4) proteins, CUL4A (87 kDa) and CUL4B(104 kDa), are two members in cullin family with 83% of identity. Mutations in human CUL4B are one of the major causes of X-linked mental retardation. Cul4b knockout mice demonstrated that CUL4B is indispensable for embryonic development in the mouse (PMID: 22606329). SIRT7 controls hepatic lipid metabolism by regulating the ubiquitin-proteasome pathway. AMBRA1 interplay with cullin E3 ubiquitin ligases regulates autophagy dynamics. The Cullin 4A/B-DDB1-Cereblon E3 Ubiquitin Ligase Complex Mediates the Degradation of CLC-1 Chloride Channels. UBE2M Is a Stress-Inducible Dual E2 for Neddylation and Ubiquitylation that Promotes Targeted Degradation of UBE2F. Cullin-3-KCTD10-mediated CEP97 degradation promotes primary cilium formation. Regulation of liver receptor homologue-1 by DDB2 E3 ligase activity is critical for hepatic glucose metabolism.